A bank is wanted much in this town. The distance to Newton or Totnes being eight miles is most inconvenient. In 1774 George III issued a proclamation to the effect that 'diminished' gold coinage was to be collected and exchanged. Richard Eales and John Dolbeare were the people in Ashburton authorized to perform this task. Above: One pound note from the Ashburton Bank, dated 1808. In 1810 the Exeter Flying Post posted a statement from the Ashburton Bank, which told of 'unexpected and heavy demands'. Payments of cash and banknotes were suspended, but the bank said that a statement would shortly be produced showing all credits and debits, promising that this would show a healthy balance. 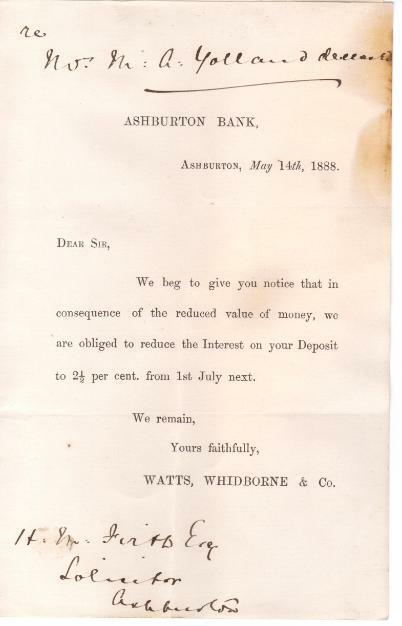 For a promissory note from the Ashburton Bank, see the Virtual museum 1800s section. R Abraham is still being shown under Bankers for Ashburton two years later, 'draw on Esdaile and Co., Lombard-street'. 'Harburton, near Totness, October 5th 1825. When John Winsor and his wife Susanna have a daughters baptized in June 1817 and October 1818, John is described as a banker. Letitia Dorothea Cuming. Born in Ashburton in 1786*, she was the daughter of George Winsor and Letitia Luscombe of Totnes. It was Letitia's brother John Winsor who was part of the Ashburton Bank. She married Francis Brooking Cuming, a solicitor who entered banking and became a partner in Brown, Winsor and Cuming. However, Francis died in 1822, and his wife was left his share of the partnership. In 1825 there was a run of several days on the bank of Mssrs Brown, Winsor and Cuming. Rumours that the bank was suspending payments were current in the morning, and were 'fully confirmed' in the afternoon. 11 December 1858 'At Ashburton, aged 76, John Winsor esq., for many years one of the firm of the Ashburton Bank. This is possibly the same building which housed a large safe until the latter part of the 20th century. It was roughly in the area of No 81 East Street. 1837 Ashburton. Devon and Cornwall Banking Co. (branch) - R Bean, Manager. Draws on Barclay, Tritton and Co.
Pigot and Co.'s National Commercial Directory of the whole of Scotland and the Isle of Man etc., London, 1837. Above: Bank House, 22 West Street. Where Watts, Whidbourne and Co. operated from? 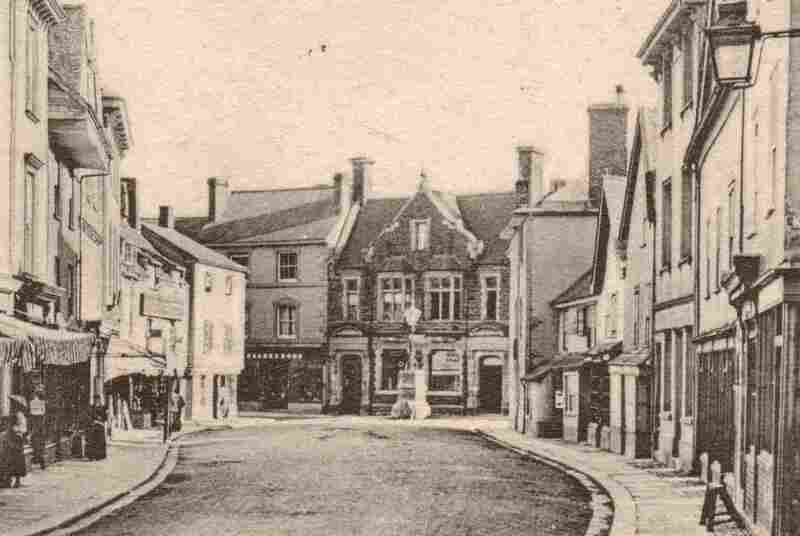 In the 1871 census two households are in between the Exeter Inn and where William Creber, bank manager, is living. This may be John Bickford, who by the 1881 census was a 30 year old bank manager. When his mother died in July 1891 he was manager of the Capital and Counties Bank, Ashburton. In 1892 Henry Stevens was clearing the area where the Duke's Head and an adjoining house had been. The Capital and Counties Bank was to occupy the site. 1893 The new premises of the Capital and Counties Bank were opened at the Bullring. 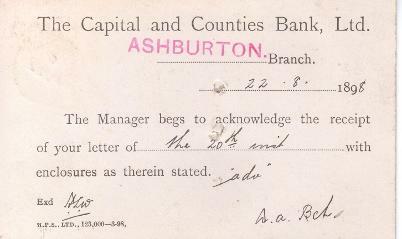 W P Rendell was appointed manager of the Ashburton branch of the Capital and Counties Bank in 1901. 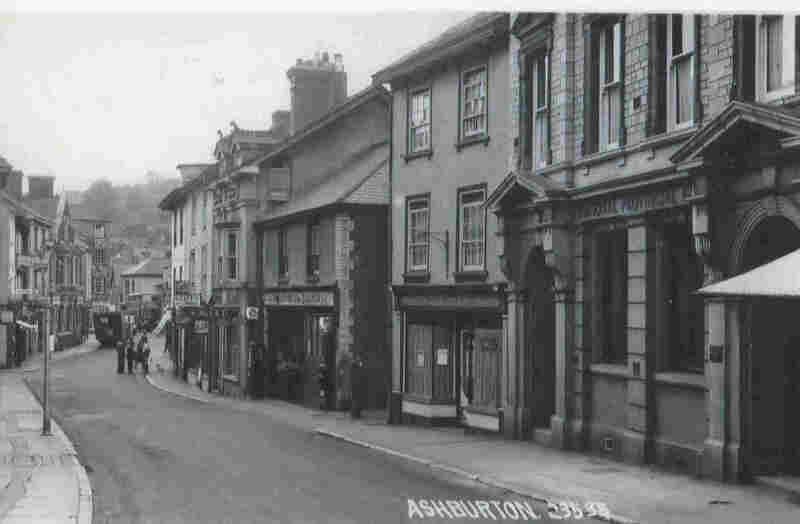 1921 Mr B Balkwill, manager of Lloyds' Bank, was appointed treasurer of the Ashburton and Buckfastleigh Cottage Hospital. B W Blight, manager Lloyds Bank, East St. He had succeeded Mr. E Dyson as manager in 1934, and retired in 1950, after 44 years service. Bertram William B Blight's birth was registered at Stoke Damerel in the last quarter of 1890. His address on his attestation papers of 1915/16 is 60, Peverell Park Road, Plymouth, the address where he was living with his parents and brother in the 1911 census. Then 20 years old, his occupation was bank clerk. By 1916 he was a bank clerk, but bored with his job he joined the 9th Battalion, Devonshire Regiment. In 1917 he was at Gheluvelt, near Ypres, and whilst trying to advance near a railway embankment he was hit by machine gun bullets. His nose and teeth were shot away, as was part of his face. He was assumed to be dead until a German soldier, pausing to examine the gold masonic ring he was wearing, realised that Bertram was alive. As a prisoner of war he was moved to Stettin near the Baltic Sea - on the way being bombed by the RAF whilst he waited at Cologne Railway Station. He remained a prisoner of war until he was repatriated in 1918, possibly being swapped with a prisoner of war in Britain. Treatment for his injuries then began, in Millbank and Wandsworths hospitals in London, and Everest in Teignmouth. For two years he was at Queens, Sidcup, a specialist facial surgery hospital, where he underwent 12 operations, with his face being rebuilt using the techniques pioneered by Dr Harold Gillies. He was left with severe scarring, the Ministry of Pensions declaring that his wounds were equivalent to losing a limb. Returning to his old job at the bank, Bertram was promoted to the manager of Ashburton in 1934. He was a member of the Plymouth Hoe Masonic Lodge No. 4235, and was Master in 1930/31. His story was featured in Faces of Conflict (2014) - an international study into art and facial reconstruction. Bertram Blight died, aged 61, in 1952, his death being registered in the Newton Abbot district. He is buried at Ashburton. Many thanks to Richard Blight for the above information. He underwent 12 operations to reconstruct his nose, later ones being under local anaesthetic because of the poor state of his health. Captain Russell was his surgeon. Above: In Stettin prisoner-of-war camp. Bertram is on the extreme left. Right: On a Devon beach. 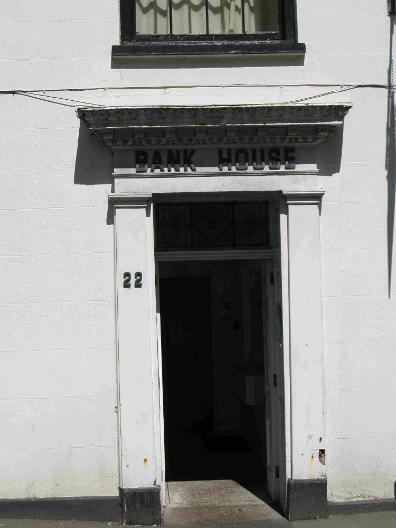 1843 The Ashburton branch of the Devon and Cornwall Bank was closed at Christmas 1842, forcing the people of Buckfastleigh and Ashburton to go to Newton for their banking transactions. Right: 19 Est Street - in 1891it was the Devon and Cornwall Bank. 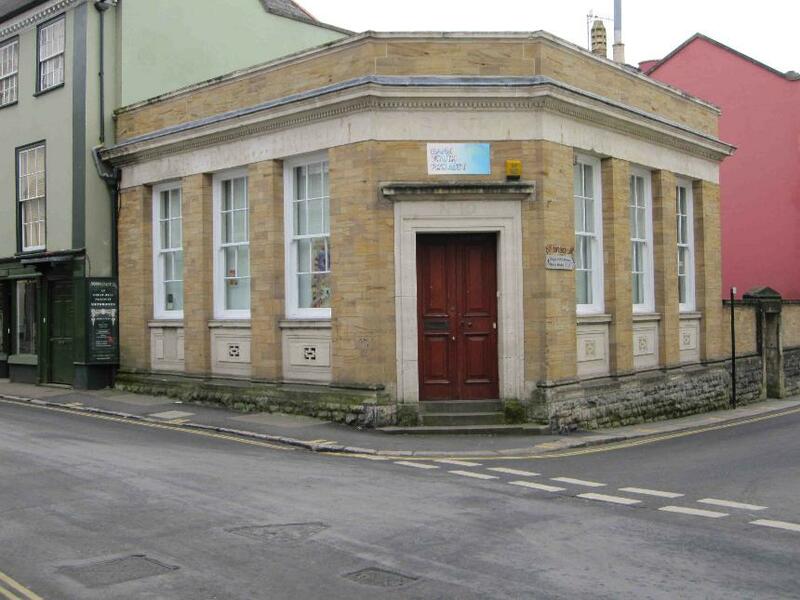 In April 1891 new premises were opened for the Devon and Cornwall Bank. Built by Mr Henry Stevens from plans prepared by Mssrs Rowell and sons, the project had cost over £2500. 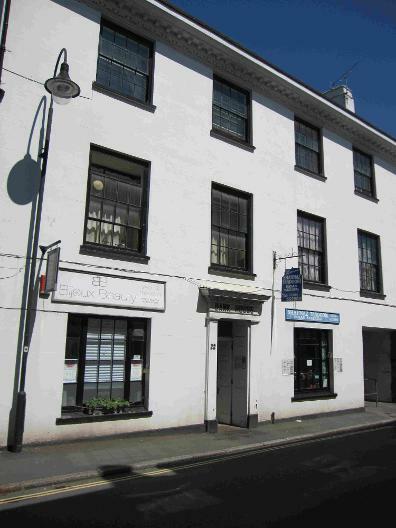 Occupying 'an imposing position in East St' the building was described as classical in design, with the lower storey constructed of axed Haytor granite, whilst the upper storey consisted on dressed granite and Ham Hill stone. The manager's private apartment was at the top of the building. 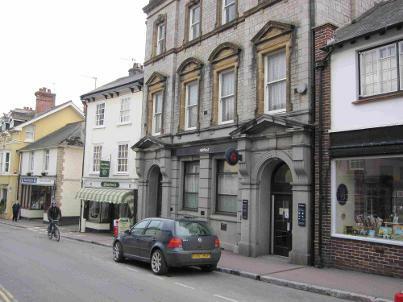 According to the Western Morning News, the bank was built on the site of a property where Dean Ireland had once lived. Left: A cheque drawn on the Devon and Cornwall Banking Company. James Woodley is paying H M Firth £1 in 1894. 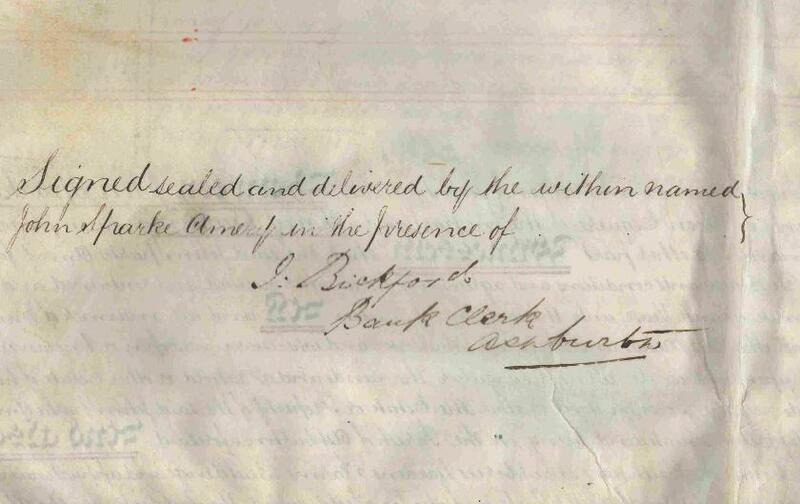 For another example of a cheque from this bank, see the Virtual Museum 1890s section. The 1901 census shows Charles John Jeffery as manager of the Devon and Cornwall Bank in East St. Born in Devonport, he is aged 47 and has a wife, Kate. Henry Stanley Joyce (1882-1961) wrote several books about fishing and the countryside, including 'By Field and Stream', which he published at Ashburton in 1934. In 1911 he was a bank clerk, boarding at Folkestone; by the time of his marriage* in 1917 he was a cashier at the Dulverton branch of the National and Provincial. At the outbreak of the Second World War in 1939, Henry and his wife were living in Barnstaple. Henry was a retired bank manager. From Mike McDonald: 'Uncle Harry loved the countryside, and became quite well known in England as an angler and writer on rural topics. He wrote about six books and many articles for publications such as Field and Stream, which he illustrated himself with watercolours and pen-and-ink drawings...He wanted to be a farmer, but his mother thought that wasn't good enough for him, so he was made to join a bank against his will. He became a manager of the National Provincial in Barnstaple, and apparently was quite good at it, but never enjoyed the work. He was good at swimming, and at one time instructed the Portsmouth police in lifesaving. My mother told me he saved someone's life by jumping off a pier in Poole harbour and rescuing them. Above: The National Provincial Bank. Circa 1950s? In 1928 Mr B O Russell was appointed manager of the Midland Bank in Andover. He had been manager at Ashburton since the bank opened over three years before. 1878 Miss Susan Beck is the agent for the Devon and Exeter Savings Bank in East Street. It is open from 12 until 2 on Tuesdays, and 2 until 5 on Saturdays. Devon and Exeter Savings Bank, East Street. Miss S Skinner, agent. 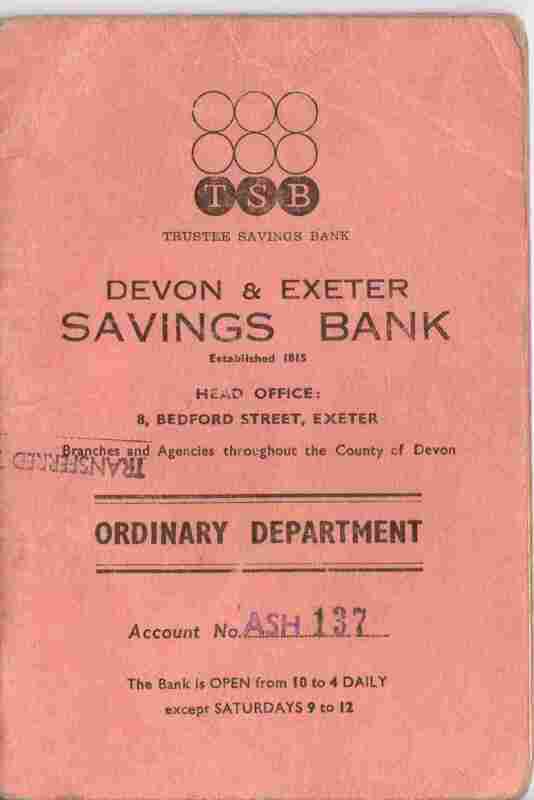 Above and above right: A Devon and Exeter Savings Bank book from the mid 1960s. 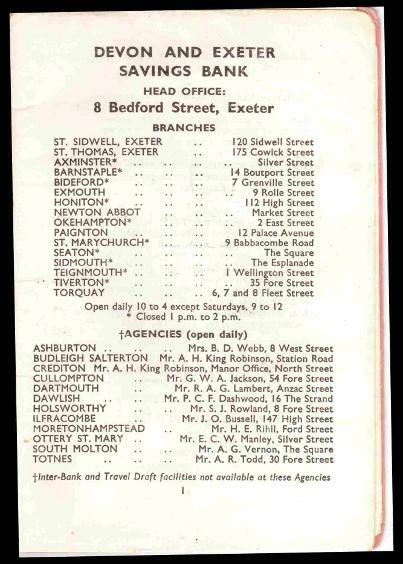 Mrs B D Webb is the manager, and the address of the bank is 8 West Street.